Those times are long gone, when grooms weren’t too worried about how they were going to look at their weddings. Nowadays, every groom wished to look his best when he is standing up the stage and watch his bride walk towards him. Groom Attire deserves attention as well as the brides’. We should not ignore the fact that the weddings are life altering not only in case of brides but grooms as well. They should look the part of the eager man who is ready to go on a lifelong adventure with the girl he lost his heart to. Getting dressed up for your girl is something we always encourage, however, never we do it more so than on the day of your wedding. As a groom, you must already have an idea about what you want to look like at your wedding. The inspirations and options are endless. 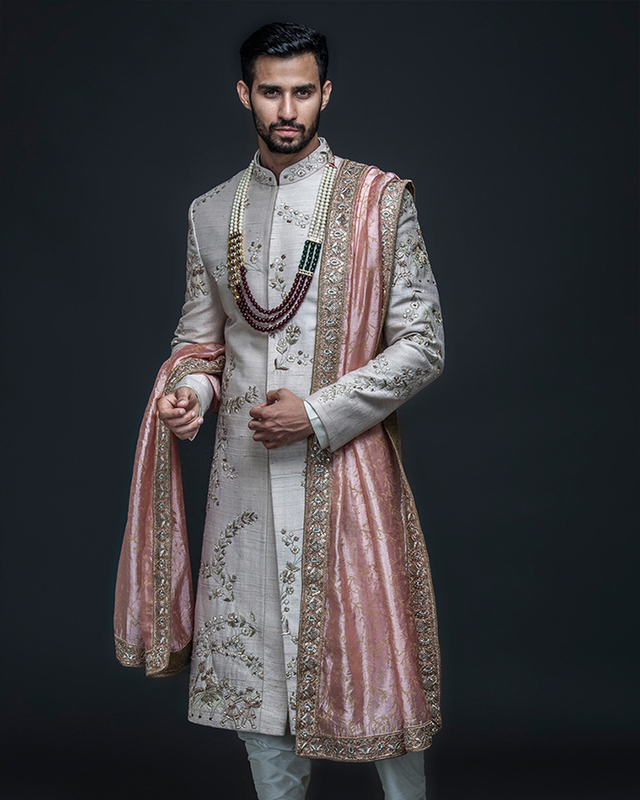 If you are opting for Sherwani for your wedding, you can go all regal and traditional or you can put a nice twist to it for your wedding or some Mehendi like function. You are young and in love, so why not make a display of it. 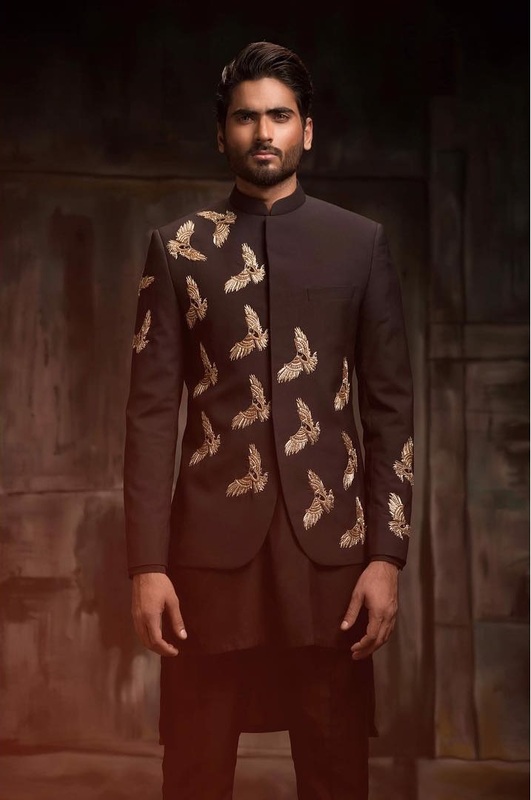 In this article, we have brought you a few ideas and the groom wear designers behind them so you can explore what might be your look for the big day. 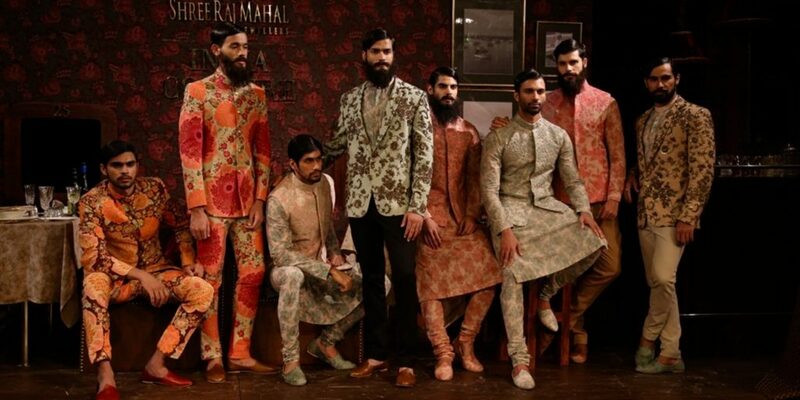 Yes, we know you are too little too over Sabyasachi after the recent flood of celebrity weddings. However, what can we say; the man is a magician with needles. 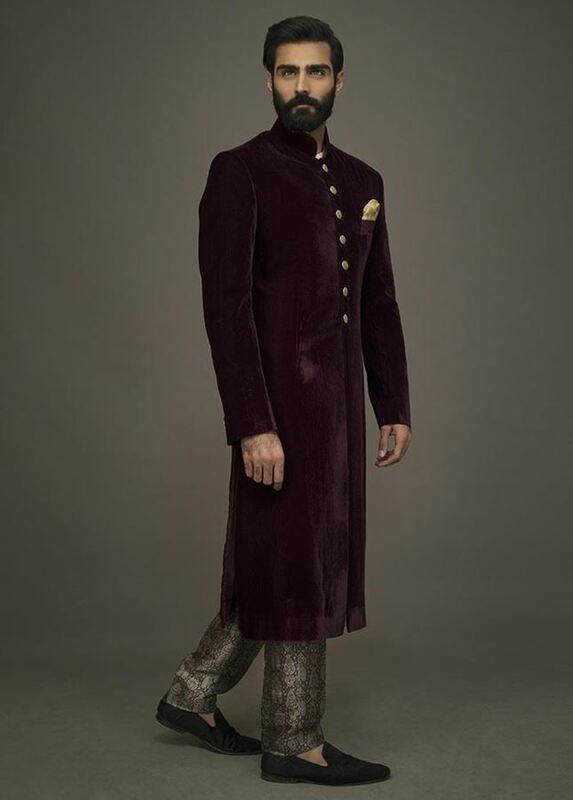 His ideas for Sherwani are unique and gorgeous, which is why you keep seeing his articles worn by famous celebrities and fashionistas alike. 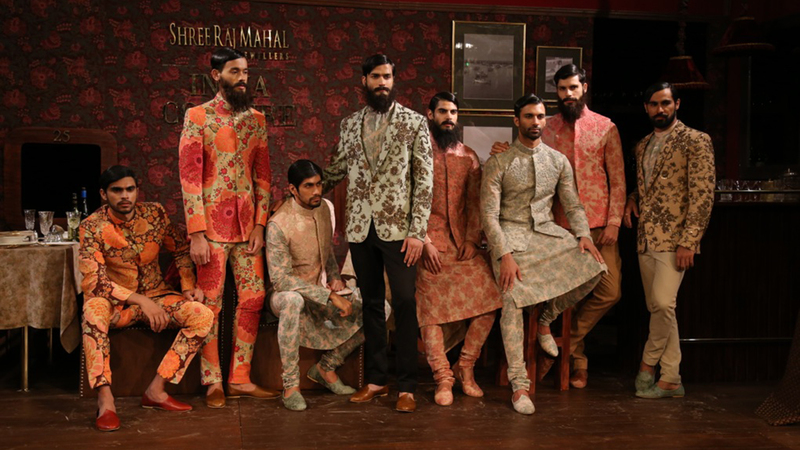 What we like most about his menswear designs is that no matter how experimental he gets with the design and the patterns, his clothes still retain their masculine sophistication, which is what you should aim for, being a groom. 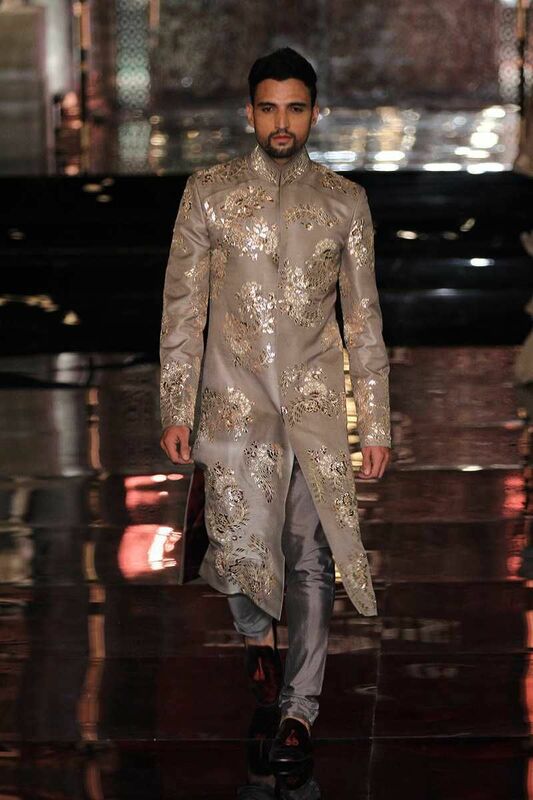 Deepak Perwani is considered the foundation of modern men’s fashion in Pakistan. 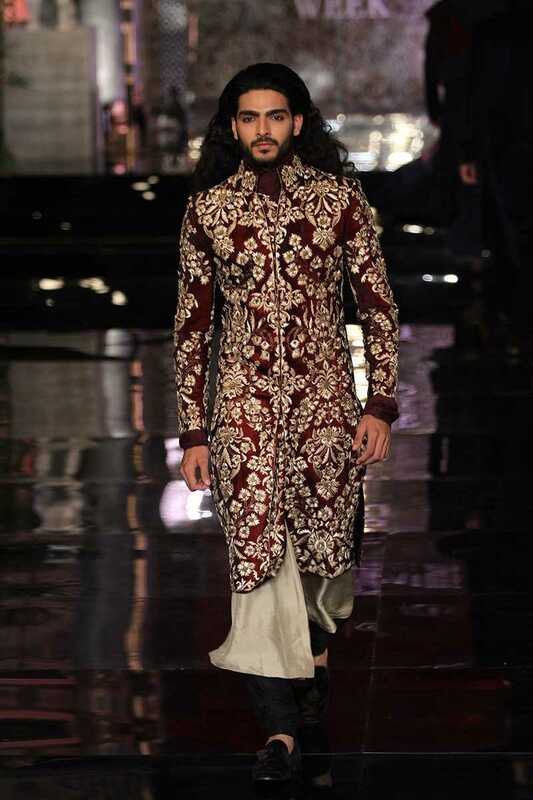 His designs for Sherwanis always tend towards cool reserved elegance. Deepak’s name has been a brand for 24 years now, and everyone in our country knows his genius for playing out classically beautiful in the best ways possible. 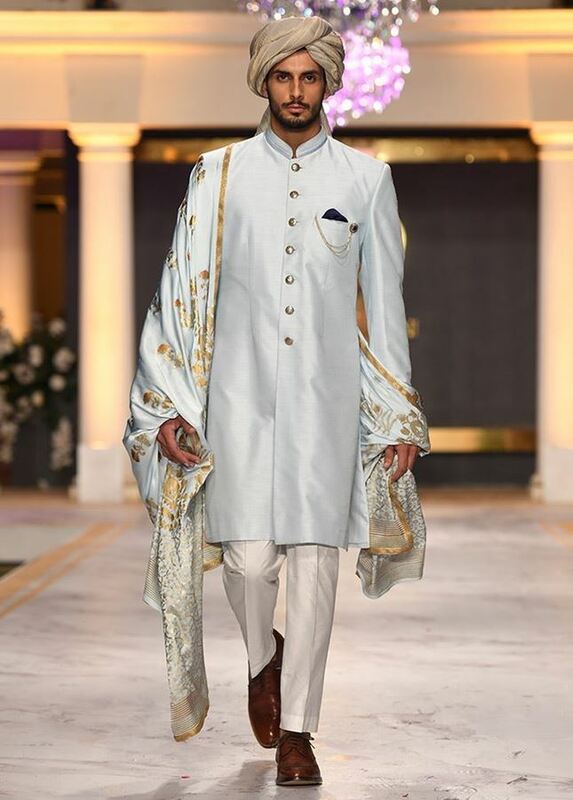 However, we have selected two of his articles that are a trendy twist on the traditional attire; the velvet Sherwani with Jamawar trousers and an ice-blue Sherwani that’s too pretty for words. 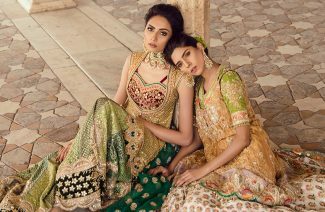 You can wear these colored ensembles to complement the dress of your bride. Trust us; the pictures of the event will come out dazzling. We all love Nomi Ansari’s colorful ensembles for ladies that are extremely fun to wear. He has created a name for himself with his really fun ideas about the festive and formal wear. 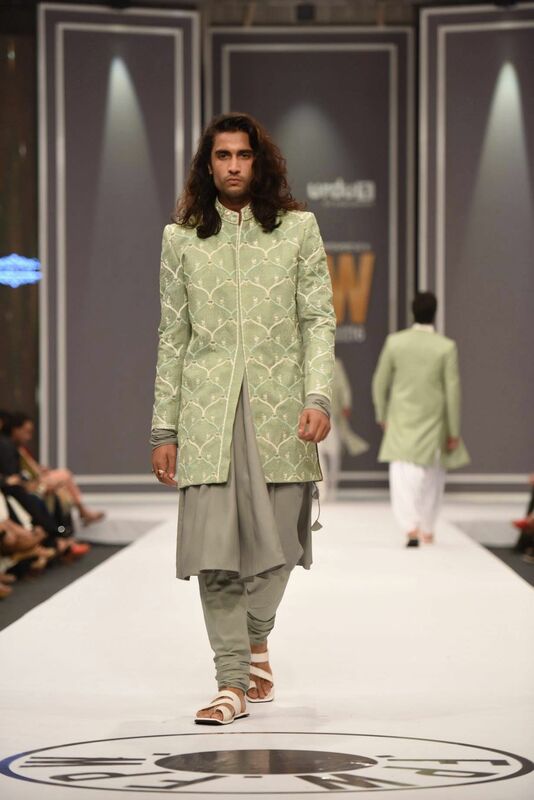 However, Nomi also has created some really refreshing men’s ensembles that are perfect for your wedding functions. You will not regret choosing Nomi ever, as many of our television celebrities will vouch. 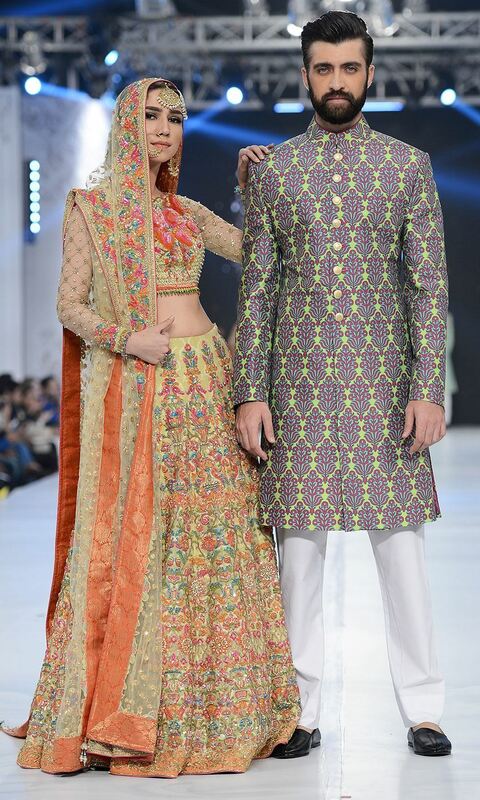 As a groom, you can choose his Sherwanis to achieve the look of a modern playful groom. For one, you will find more color choices with this label than any other designer, and that’s for sure. 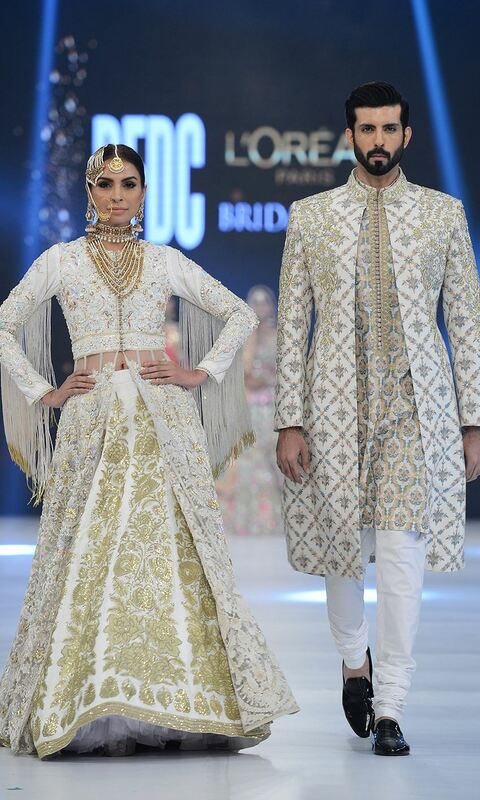 We have Deepak Perwani and India had Manish Malhotra. He, too, is the epitome of fashion with a really refined eye for design and rich patterns. His brand label earned 1 Billion INR in 2014. Regardless of the occasion, Manish is the go-to designer for many B-town celebrities (Khans, Kapoors and Bachchans included). And he’s proven it time and again that he knows just how to make his patrons stand out and shine. 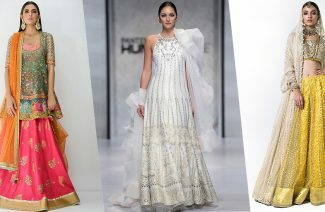 No red carpet, wedding or festival is ever complete without Manish Malhotra designs glittering on both men and women. 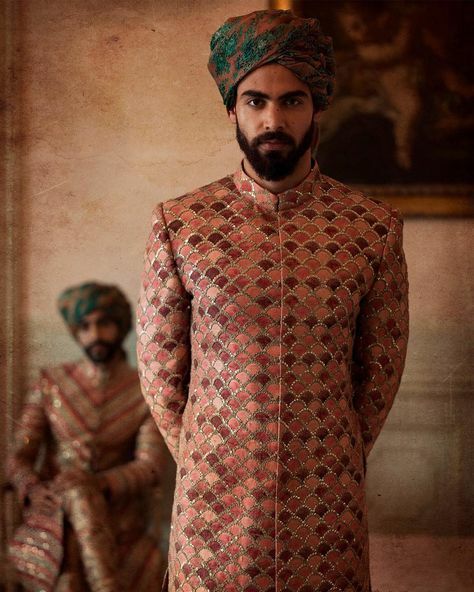 His Sherwanis are in particular a favorite amongst real grooms and that on the big screens. 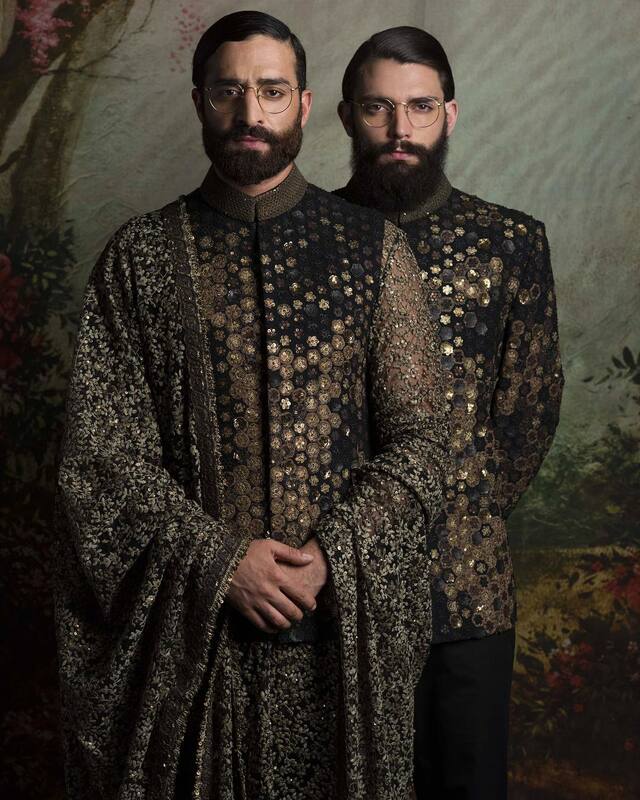 Dynamic designer duo Deepak and Fahad are known for their brilliant menswear designs. Young and enthusiastic; these designers do a lot of experiments with their clothes, and their boldness pays off beautifully. They have to be the most electric designers in men’s fashion niche. Their pallet might be common enough but their cuts and designs are anything but common. You’ll love their work with its mysterious and unique appearance. 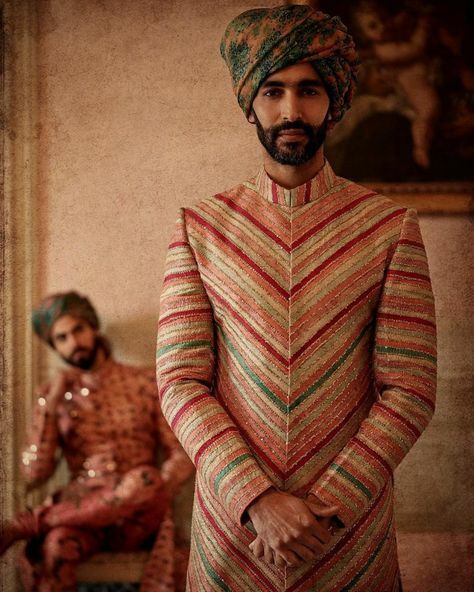 For a style-savvy groom, Deepak and Fahad is the best bet. You can also suggest this brand to your grooms’ men and your best buds will love the eccentric vibes of D&F outfits. So which designer do you think might justify your personal style?